If you have any questions about payments, shipping or refunds please check out the shop policy page. Thank you for looking and enjoy! 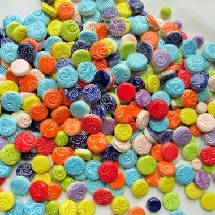 A vast and colorful selection of small different shapes, such as squares, circles, triangles and diamonds. All tiles are handmade out of wet clay then painted, glazed, and fired in a kiln twice. The selection is always changing and I will be adding more every week so come by often and enjoy! 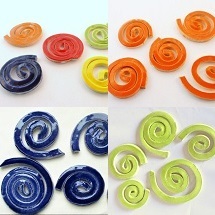 Here you will a selection of what I call ceramic swirl shaped tiles. All tiles are handmade out of wet clay then painted, glazed, and fired in a kiln twice. 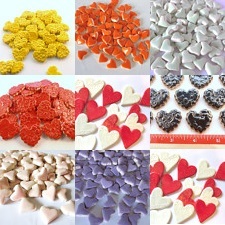 Here you will find a large selection of handmade ceramic heart shaped tiles. All tiles are handmade out of wet clay then painted, glazed, and fired in a kiln twice. 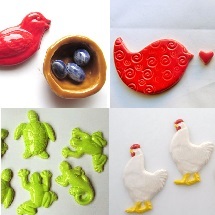 A growing selection of different animal shaped ceramic tiles. All tiles are handmade out of wet clay then painted, glazed, and fired in a kiln twice.